It is the aviation industry that has been most affected by the constant security threat and therefore the organisations where there are fewest margins for error. ID cards and passes should always include an Optical Security Device as part of the armoury of anti-counterfeit security. Security Foiling's Identity-SECURE solution is ideal for the aviation industry and enables card making and issuing in the secure environment of the aviation organisation itself. 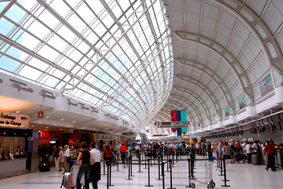 Security Foiling's solutions are trusted to protect 24 airports for the Australian Government. Visit our case study page for more information.